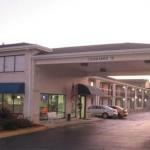 Located off Interstate 77 this Rock Hill hotel is 20 miles south of the centre of Charlotte North Carolina. It offers a continental breakfast 24-hour front desk and free in-room Wi-Fi. Tea- and coffee-making facilities are included in the boldly coloured guest rooms at the Bestway Inn. Free local calling and cable TV with the HBO channel are provided. Free parking is on site at this Rock Hill hotel. Vending machines are available. Carowinds Amusement Park and the border of North Carolina and South Carolina are 15 minutesâ?? drive from the Rock Hill Best Way Inn. Winthrop University and the Rock Hill Galleria Mall are less than 10 minutes away by car.